Protestors demonstrate in front of the U.S. Border Patrol Station on Saturday, June 30, 2018, in McAllen. 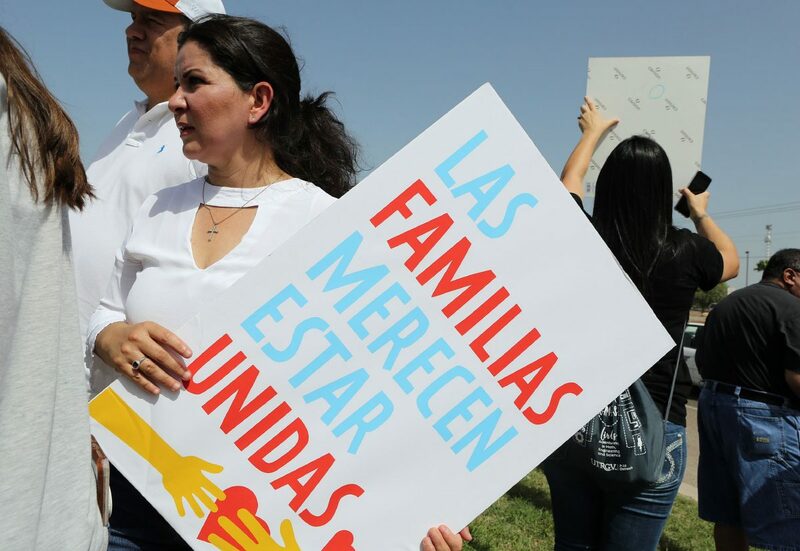 They rallied to bring awareness to the U.S. Immigration policy of family separations along the southern border. McALLEN — It’s time to unite and send a message to leaders in Washington, said a Georgia state political candidate who was the guest speaker at a political rally here Saturday. Arnold James was speaking at the Families Belong Together rally held on the sidewalk of Logicorp Enterprises on the Military Highway across from the U.S. Border Patrol immigrant processing facility. She describes herself as a humanitarian, a wife, a mother of 12 and a U.S. Army veteran. Arnold James was one of over 200 protesters fighting for the rights of the immigrants trying to seek asylum in the United States. 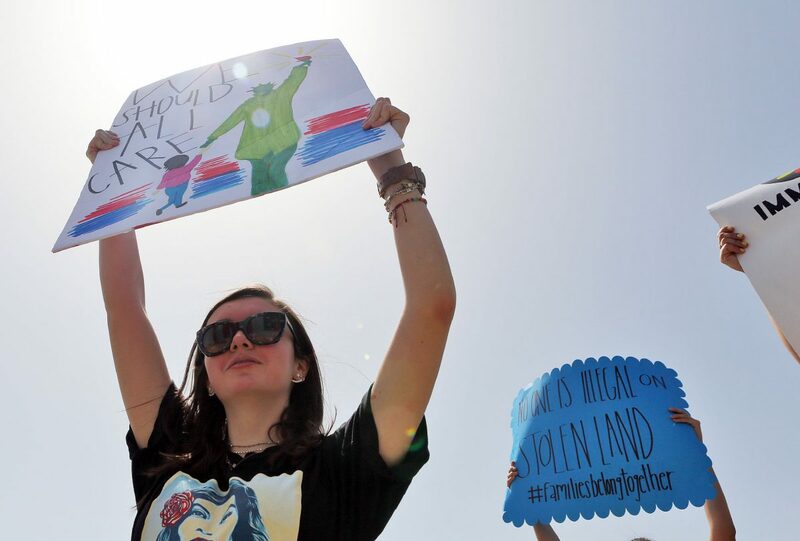 Elena Gomez, 9, holds up a a sign as protestors demonstrate in front of the U.S. Border Patrol Station on Saturday, June 30, 2018, in McAllen. They rallied to bring awareness to the U.S. Immigration policy of family separations along the southern border. Protestors demonstrate in front of the U.S. Border Patrol Station on Saturday, June 30, 2018, in McAllen. They rallied to bring awareness to the government's "zero tolerance" immigration policy of separating families apprehended along the southern border. Arnold James, who arrived here Friday, drove around to the immigration processing centers seeking more information on detention situation of girls. She said the news reports have mostly been about the boys. The protesters wore white and came from all across the Valley, some coming from as far away as Georgia and South Carolina and other parts of Texas to see the situation personally. Sara Vann, host of the McAllen rally said the separation of families was made by a reckless administration and cruel-minded president. As the morning continued, the microphone was open to anyone who wanted to speak their mind. Some spoke about their relatives and their deep connection to Mexico, the cruelty of separating families and letting the immigrants seek asylum. Some advocated for abolishing Immigration and Customs Enforcement (ICE). 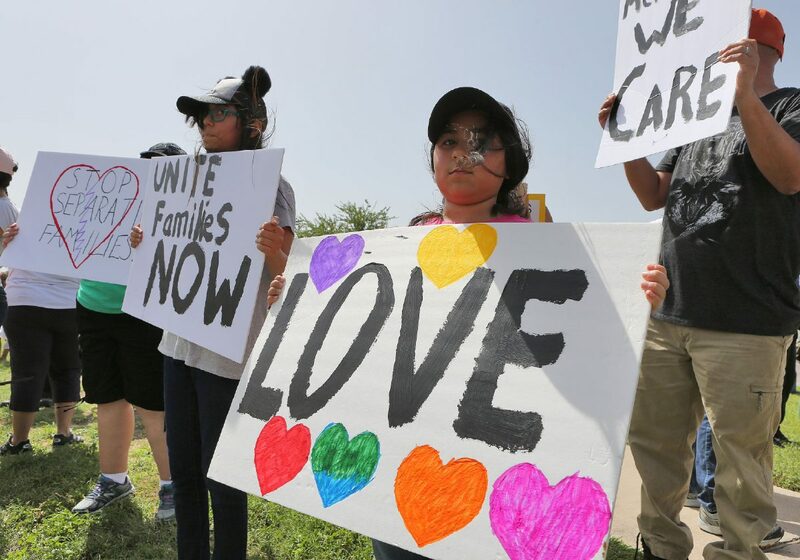 The Families Belong Together rally was one of over 600 marches nationwide and one of 35 in Texas which took place Saturday to express opposition to the Trump administration’s displacement of more than 2,400 children from their families under the zero-tolerance policy.